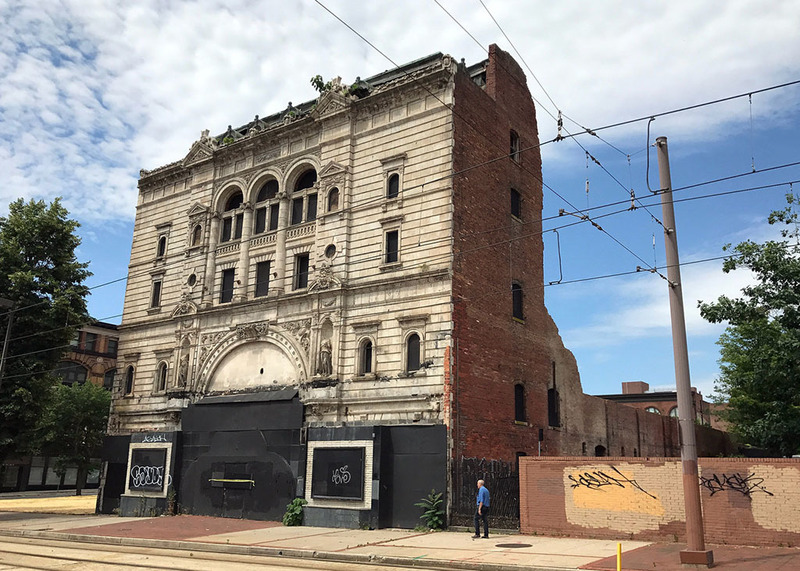 Built in the late 1800s, the Mayfair Theatre, originally known as the Auditorium, was once considered one of the finest showhouses in Baltimore, if not the country. Though the building's ornate white stonework façade and grand marquee readily identify it as a theatre, the building and the site have a wide and varied history. Before the Mayfair theatre was constructed, this site was the home of the Natatorium and Physical Culture Society (a spa and swimming school), a Turkish bath house, and, remarkably, an indoor ice rink (one of only six in the country at the time). During its heyday, the theatre became well known for its many vaudeville acts and plays—including Spencer's Tracey's 1929 performance in Excess Baggage—and for what the Baltimore Sun called its "beautiful and cozy interior," which was painted in rich golds, dramatic reds, and creamy whites all lit by hundreds of lights clustered on crystal chandeliers. The walls inside the theatre were frescoed in Byzantine and Renaissance styles and the private boxes had velvet, olive-colored drapes. The theatre's reception room had luxurious red carpeting, a telephone, and a maid. During intermission, a Hungarian orchestra played in the theatre's palm garden and ice water was served to "ladies" in the audience. The theatre seated 2,000 and had 30 exits, making it easy to evacuate in case of fire. The building's life as a concert hall and live theatre venue came to an end in 1941 when it was converted to a first-run movie house; the building's name was changed that same year. In time, the post-war exodus of residents from cities all over the country and the growth of suburban multiplexes in the 1950s relegated this grand structure to showing Grade B horror and action movies. The theatre's last movie was shown in 1986. Unfortunately, after years of neglect, the building's roof collapsed in 1998. In the late 2000s, plans to turn the building into apartments and retail space failed to get started. Then, in September 2014, a two-alarm brought further damage to the Mayfair and gutted the adjoining New Academy Hotel. The demolition of the damaged New Academy Hotel revealed serious structural problems with the Mayfair Theatre. 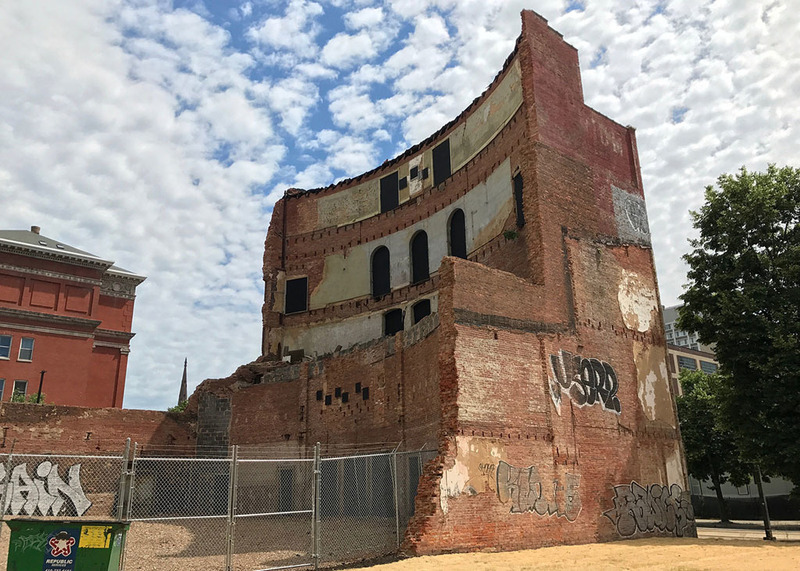 The city decided to tear down much of the old theatre but they kept the facade and is seeking a developer for the site who can preserve the remains of the once-great Mayfair Theatre. 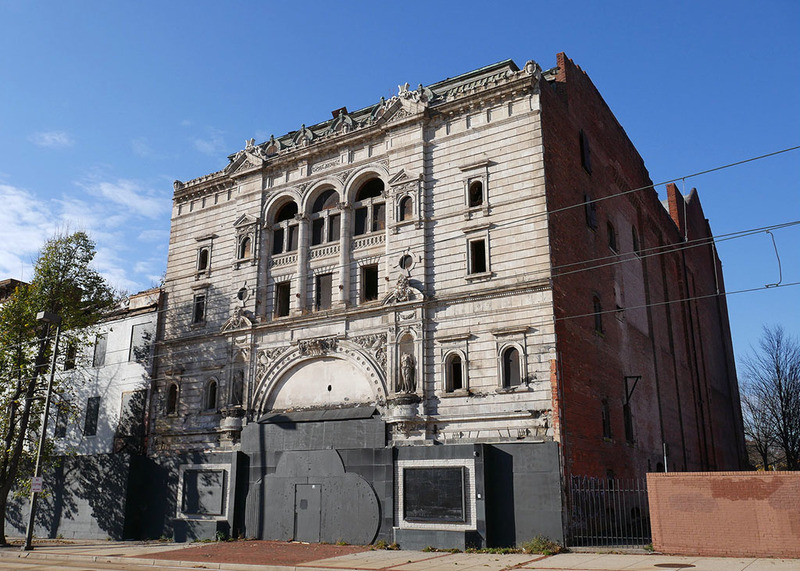 Theresa Donnelly, “Mayfair Theatre,” Explore Baltimore Heritage, accessed April 19, 2019, https://explore.baltimoreheritage.org/items/show/163. Published on Oct 9, 2012. Last updated on Nov 27, 2018.